The Yuletide season is just round the corner, and if you’re looking for Napa activities because Napa Valley is your holiday destination, there couldn’t be a better choice! The beautiful scenery, as well as the world-class wines and cuisine, are just a few of the many Napa activities that you can enjoy this Christmas. Aside from the scenery and the food and wine, the low-discount rates offered by many hotels in the Wine Country will also surely be a pull for a lot of tourists. December is one of the quietest months in the Napa Valley where several hotels slash discounts to attract visitors. Despite the relative stillness for tourism in the Napa Valley, you will be surprised and delighted about the several exciting activities lined up for you, especially when the holidays are just coming near. With the warmth brought by the fine-quality wines, it’s one of the reasons why you will want to spend time in and celebrate Yuletide cheer in the wine country! One of the activities you don’t want to miss while in Napa Valley during the holidays is the Twelve Days of Christmas at Meadowood, a lovely resort and spa. For the first time in eight years, the Twelve Days of Christmas will not only feature one winemaker (as it did in the past), but several of them. The Meadowood team will give themselves and their guests the chance to showcase more winemakers during the course of the event. The Twelve Days of Christmas will include both established and rising wineries in the country. Meadowood will also feature world-class chefs and their culinary creations on each of the twelve days. If you’re such a wine and food lover, you cannot afford to pass up this chance! Want to take a tour around the Napa and Sonoma Valleys? No problem because Napa Valley Wine Trolley and Sonoma Wine Trolley will take you to some the most beautiful spots in the region. Hop aboard the open-air cable cars and explore scenic views of Sonoma vineyards, explore wineries, behold the lovely Victorian-period houses, and delicious catered lunches, and much more! Grab a reservation to hop aboard the Napa’s Holiday Wine Trolley and there you will get to enjoy the fun ride along with Christmas carols. The holiday spirit continues in the Wine Country, even up in the sky! Many tourists would like to take advantage of the beautiful seasonal scenery in the Napa Valley by taking a hot air balloon ride. Balloons Above the Valley (BATV) is the pioneer operator of hot air balloons flights to tourists in Napa Valley. Enjoy the picturesque scenery of Napa Valley like you’ve never seen it before. The Napa Valley doesn’t have the typical snowy-white scene during the holidays, but you’ll be met by an otherworldly beauty unique to the wine region. The sleeping vineyards are upstaged by the brilliant yellow blooms of the wild mustard. Watch the emerald green rolling hills being enveloped by a white mist which creates a somewhat a mystic appearance and makes the views even more beautiful. While summer and autumn may be the best times in Napa Valley according to most tourists, you can also find and enjoy delightful perks and amenities in the Napa Valley during Christmas time. With exceptionally beautiful seasonal scenery, a relatively leisurely pace, and excellent discounts, wintertime also means it is also the best time to ride on a hot air balloon! 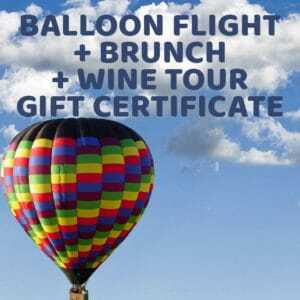 Balloons Above the Valley is always here to give you the Napa activities that you can enjoy this Christmas.